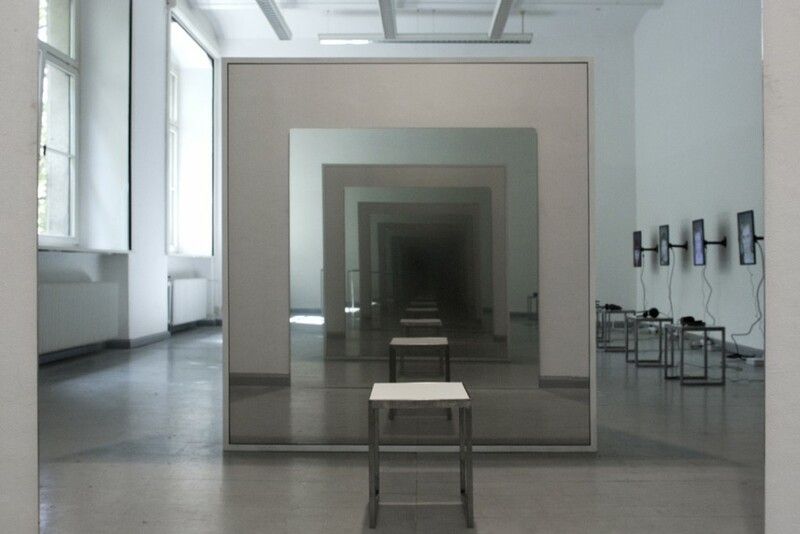 An interactive and accesable installation: a triangular space equipped with a door and a semipermanent mirror facing another equal sized mirror. 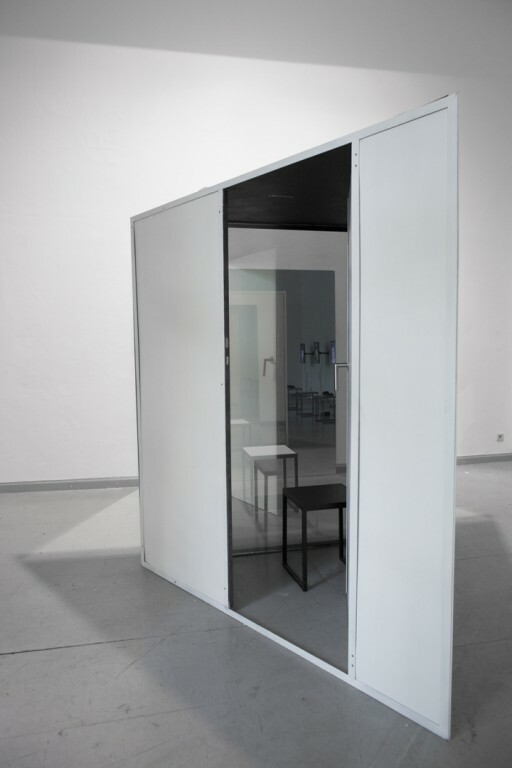 The work investigates the act of awareness and perception within the inter- and intrapersonal relation and a possible confrontation with an extrapersonal reflection. Within the triangular space the spectator can observe without being seen, while the other in front of it is exposed to its reflection and the possible gaze of the other behind. The self perception is conditioned and conditioning. It is by the means of the gaze of the other(s) on one self being internalized as such. 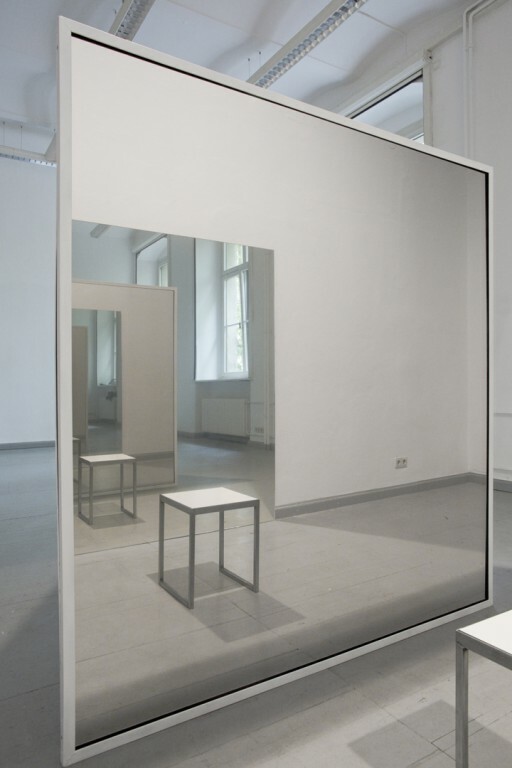 The other mirror opposing that view duplicates the situation and opens another perspective: the anticipation of an infinite metalepsis - an endless regress of self-referentiell reflections of two parallel mirrors - impossible to perceive for the incorporated self inbetween, but for the "immaterial" gaze behind the mirror. The 5-channel-video installation shows on each screen a concentrated face, directly gazing into the camera/visitor or watching down towards something out of sight. The sound reveals the activity of drawing. Each person was facing ones own reflection in front of a semi permanent mirror, where behind a camera was recording that process. The length of each video ranges bewteen ~ 15 and 80min, according to the decision of each portrayed person. In the actual installation the visitor sat in front of each face, oscillating between being the watcher and being watched - becoming the reflection of each face.